The Chinese zodiac Horse is often gregarious, popular, center of attention, highly spirited, bubbling fountain of enthusiasm and energy. This is in high contrast to the Goat’s more demure, cultured, refined, and emotionally supportive nature. However, if ever opposites attract, the sheep and horse compatibility may be the epitome of such attractions. The Horse will fall quickly for the novelty and stimulation of the new relationship. This can easily be mistaken the as the emotional connection craved by the Goat who will be swept off his/her feet by the admiration. The beginning of the horse and sheep relationship may seem easy because each will be deeply attracted to each other. Together they will complement each other’s strengths and weaknesses. For example, the independent male or female Horse will be happy to leave the home front in the capable hands of the Goat man or woman. The Sheep will relish home life and will gladly surround the pair in comforts and beauty. Ever shy and soft-spoken, the Goats will relentlessly support their partner by staying faithfully by on the sidelines while their lover takes center stage. Likewise the Horse will be appreciative of the fact that there is no competition for attention from their partner and of course they have their persistent support. Further, to offset the Goat’s dreamy and emotional nature, the Horse brings drive and energy to the relationship. This will undoubtedly help keep this Chinese zodiac love match from becoming unfocused to the point of losing their grip on reality. Soaking up the emotional attention, the sheep will relish in the strong physical sexual connection and attraction between the horse and goat in bed. Over time the true restless nature of the Horse man or woman will appear and the male or female Sheep’s sensitivity will be revealed. Not to worry though, the two can be quite complementary. The sheep and horse compatibility is not always easy even when they are dating. There are some definite things to watch out for in the Goat-Horse relationship. It will be equally important that both have defined responsibilities for the day-to-day needs of life. The Goat is not good with mundane tasks and the Horse may be equally so, given his/her lack of attention to anything for long. The Horse’s frank and straightforward style can easily injure the feelings of the sensitive Goat. Therefore, the Horses must learn to be aware of the delicate and emotional nature of their counterpart. Likewise, they are not the ones to cherish doting and may feel smothered by the Goat’s protective, home-loving, or ‘mothering’ behavior. Too much of the Sheep’s emotional dependency will feel ‘needy’ and drive the restless Horse out the door, leaving their lover feeling insecure. This sheep and horse in love will need to learn to balance together the romantic need to be alone. This feeds the Goat’s intimacy cravings, while allowing the Horse to scratch their itch to be in the middle of the action. They will be all too happy to afford their partner the same level of freedom they desire. But in doing so, they will need to work on sharing feelings to ensure their lover doesn’t take that as a lack of emotional dependence or desire to be together. Other areas where the sheep and horse compatibility may struggle will be in their mutual stubbornness and abilities to manage conflict. The Goat is prone to withdraw or meltdown in the heat of conflicts, but may eventually become passive aggressive in order to get what they desire. Whereas, the Horse stands his/her ground; too obstinate to admit defeat or being wrong. Conflicts are going to happen, especially with such juxtaposition in independence versus dependence exists between two people. Having difficult, yet frank, discussions on both their feelings and their attitudes will be a catalyst for bridging conflicts in this partnership. This will take some work, but all relationships do. Otherwise the goat-horse love compatibility will go down the drain and this couple will be headed for a breakup. Learning to share and be flexible is really the key to a Goat-Horse marriage, predicts Chinese astrology compatibility. Giving the Horse an adequate amount of personal freedom, while providing the Sheep with more emotional intimacy, will be obvious to their success. 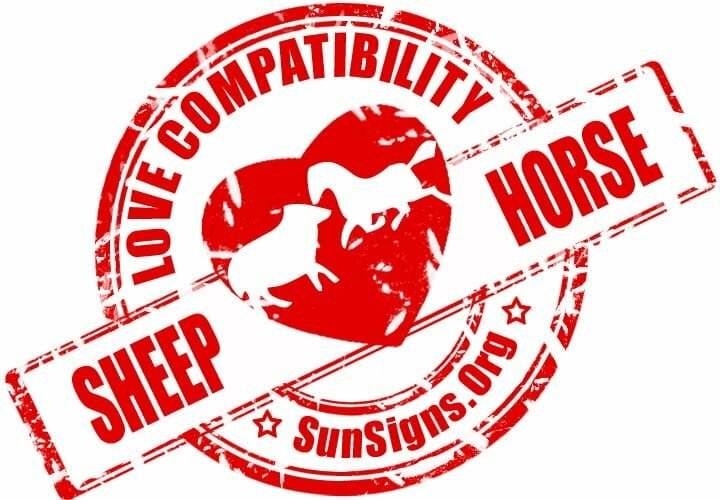 Goat & Horse Chinese Horoscope Compatibility Rated 5 Hearts!